The rodeo’s in town and the cowboys are out for blood in LASSO, from Epic Pictures’ Dread Central Presents brand. A trailer has just been issued, and the movie now has a date for general release. 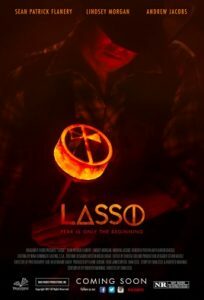 LASSO, directed by Evan Cecil from a script by Roberto Marinas, will ride into VOD November 13, preceded by a premiere screening at London’s FrightFest August 25 at 11 p.m. Sean Patrick Flanery, Lindsey Morgan, Andrew Jacobs, Karen Grassle (LITTLE HOUSE ON THE PRAIRIE) and Benedita Pereira star; the synopsis: “Kit [Morgan] and Simon [Jacobs], two young leaders of an Active Senior Tour group, head out on an adventure to a small-town rodeo festival located deep in the woods. It’s a great experience for the group…until they try to leave. Simon and Kit must save themselves, and whatever seniors they can, from becoming victims of a deadly rodeo ritual. Along the way they join up with another unexpected group of victims, including a one-armed cowboy, Ennis [Flanery], Rosheen, the rodeo queen, and Trish, a powerhouse female bull rider. Together the group must fight to survive the night from relentless bloodthirsty cowboys on the hunt for human livestock.” See the movie’s webpage here.